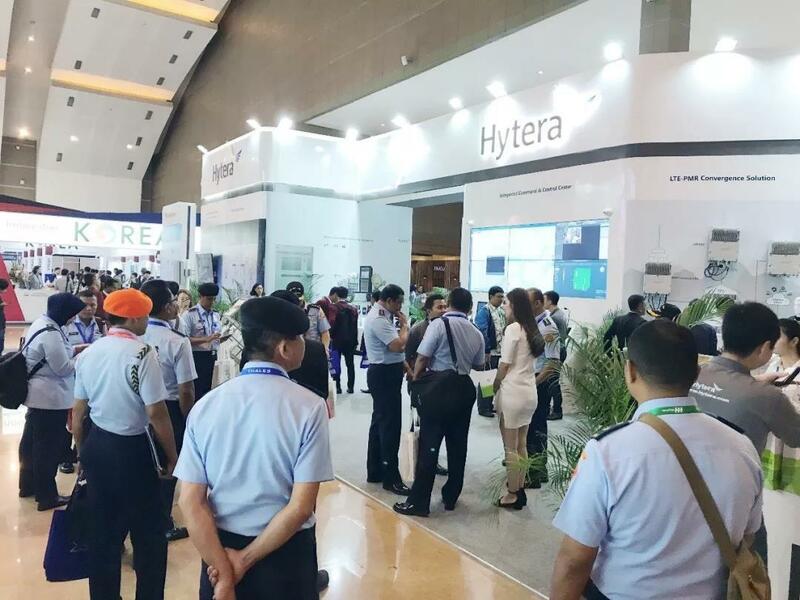 Hytera exhibited Emergency Response Solution and Integrated Command & Control Center as highlights at the biggest exhibition in South-eastern Asia –Indo Defense Expo & Forum 2018, held from November 7 to 10 at Jakarta International Expo Kemayoran, Jakarta. Hytera, a leading global provider of innovative Professional Mobile Radio (PMR) communications solutions, exhibited Emergency Response Solution and Integrated Command & Control Center as highlights at the biggest exhibition in South-eastern Asia –Indo Defense Expo & Forum 2018, held from November 7 to 10 at Jakarta International Expo Kemayoran, Jakarta. Hytera subsidiaries Teltronic and Sepura products were also presented. At this year Indo Defense exhibition, Hytera launches offically emergency response solution to public safety users. Hytera Emergency Response Solution is a self-contained and quick-response system designed for reliable communication in emergency situations such as mass rallies, natural disaster, and terrorist attack. It enables network coverage in remote areas such as mountain and woodland areas, expands network coverage in blind spots such as the subway, tunnel, underground, and provides a robust dynamic broadband link which enables voice, video and data transmission in emergency situations. With long-term technology accumulation and innovation, Hytera helps bring intelligent and integrated support for emergency management under new situation, and plays an important role in emergency rescue for public safety. For example, during the Lombok earthquake and Central Sulawesi disaster, Hytera local team helped setting up critical communication networks with emergence response solution in rescue and evacuation operations. In addition to Emergency Response Solution, Hytera Integrated Command & Control Center (ICC) was also presented. In mission critical，it’s vital to build a comprehensive visual and dispatching platform, which helps public security agencies such as police, fire-fighting, emergency rescue, and urban management with efficient and professional incident taking, handling and management, for the purpose of rapid response, smart dispatch and disciplined disposal. Another key solution brought by Hytera was LTE-PMR Convergence Solution, the other debut, which realizes fusion of voice, data and image through Hytera multi-mode advanced radio, the narrow-broadband converged networks and the end-to-end converged services. “Hytera is committed to providing a full portfolio of innovative convergence communication solutions to our customers. After eight years efforts, PT. Hytera Indonesia has established significant relationships with partners for public safety users. We fully understand communication challenges of Indonesian users in the complex and demanding enviroments they work in, and with our global team of professionals we expect to increase thier situational awarness, collaboration and response rate to further serve this country ”, concluded Xuejun Zhang, deputy general manager of Hytera overseas central department. 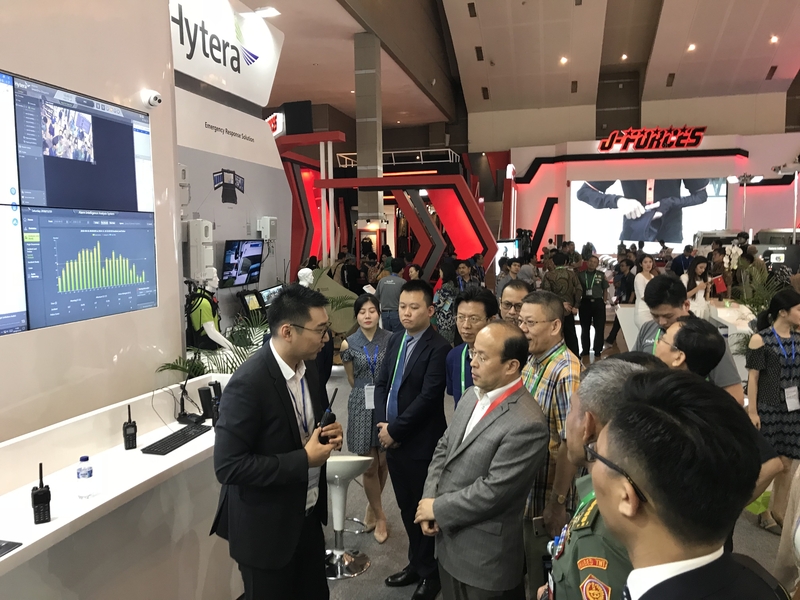 Ambassador Extraordinary and Plenipotentiary of China to the Republic of Indonesia Xiao Qian and other senior leaders visited Hytera booth during the expo and were showcased Hytera latest LTE-PMR Convergence Solution as well as Integrated Command & Control Center. Indo Defence is an international trade fair for military technology held in Jakarta. It is a platform upon which many companies from the defense industry gather to find out about news and trends for the industry. Exhibitors have the opportunity to present their products and services to an international audience and to establish partnerships with companies from the Indonesian defense industry.